A water garden can be a unique and lovely feature of a deck, garden or backyard, and it's easy to get started with these interesting garden options even for gardeners who don't have as green of a thumb as they would like. While it can be tricky to start a water garden and arrive at the best chemical balance in the water for thriving plants, once it is established a water garden can be much easier to tend than a traditional garden. Water gardens use a pool of water instead of soil, and are filled with aquatic plants rather than flowers or vegetables. Water gardens do not wilt, they do not require any weeding and the plants will not grow outside their designated container and take over other areas of the yard. Properly designed, a water garden can be a delightfully easy addition to any backyard. Choose the Location: For healthy, thriving plants, a water garden should be positioned in an area that receives full sunlight for at least 5-6 hours per day. A level area is best so the water is even, and ideally a water garden should not be positioned under trees or other plants that will shed a lot of debris into the water. Choose the Size: A simple, basic water garden can be attractive in half a wine or whiskey barrel or another large container, or more elaborate gardens can be full size ponds. Smaller options are easier for beginners, though larger gardens can support a greater diversity of plants and fish. Plan the Depth: The best water gardens will have some depth variety to support both shallow plants as well as deeper, underwater vegetation. If plants and fish are to be left in the garden through the winter, the garden should be at least 3-4 feet deep at its deepest point, though shallower shelves and niches can be used for parts of the garden. Install the Garden: A water garden can be installed professionally, though many gardeners choose to do it themselves to save costs and have the satisfaction of creating their own aquatic paradise. A smaller container water garden needs little installation other than being positioned properly, while larger ponds will need appropriate filters, pumps and liners. Add Water and Plants: After adding water to the pond or container, it should rest for several days to remove chemicals, or enzyme treatments can be used to help balance the water's chemical composition and neutralize unwanted additives. Then plants can be added, including submerged, emergent and floating vegetation. Approximately 70 percent of the water's surface should be covered with plants, and great options include water lettuce, water lilies, water hyacinths, parrot feather, pennywort, cabomba, anacharis, floating heart, irises, lotuses and cattails. Care for Plants: Once established, aquatic plants require very little care other than removing dead foliage and occasional fertilization – roughly every 2-4 weeks during the summer, and less frequently in the winter if the garden is still growing. Plants may need thinning occasionally. Consider Fish: Fish are not always part of a water garden, and many types of carp, goldfish and koi will feed aggressively on the most popular water plants. 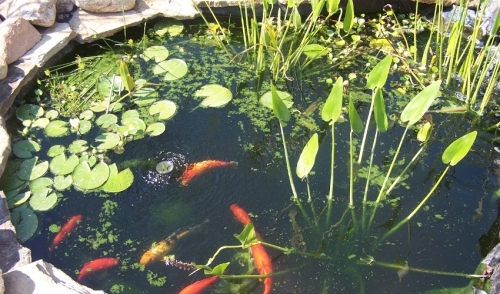 If you do want to add fish to your water garden, choose fish and plants carefully so they can easily coexist. Water gardening can be a rewarding backyard venture, one that any gardener can undertake. If your thumb isn't always green, maybe it's a pretty aquatic shade of blue!